I recently read an article that was shared by the wonderful ladies over at The Inspired Treehouse. I love following these Occupational and Physical Therapists because the articles they share cover a multiplicity of topics that I really know nothing about – and as a mom, I’m learning SO MUCH from them! (So if you aren’t following their posts on their Facebook page, you totally should. So here’s the article they shared – written by Nicole Sergent as a guest post on the Starfish Therapies blog. 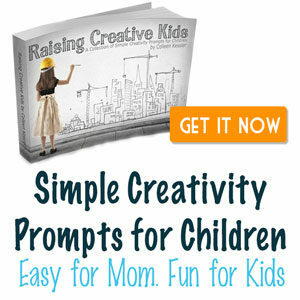 It’s very interesting… and I like the realistic-ness (if that’s even a word) of the author – she knows what it’s like to be a mom, and that shows. Many babies don’t start out liking “tummy time.” They may scream and cry as they struggle to pull up their head, and then as they learn to roll over. But struggle is part of learning. Remember that the butterfly doesn’t just POP out of the cocoon. It has to struggle. The tulip doesn’t just burst open instantly – but slowly unfolds. And it’s hard as a mom – I’ve watched two babies pass that phase, and it’s NOT easy to sit there next to your child while he or she cries and struggles. In that stage, I would typically sit and watch the clock, and offer lots of encouragement. I’d only let the struggle go on for a very short time – two or three agonizingly long minutes. But it’s paying off!! Grayson is rolling both directions, and learning how to wiggle his way in a sort of “Army crawl” to anywhere he wants to go. 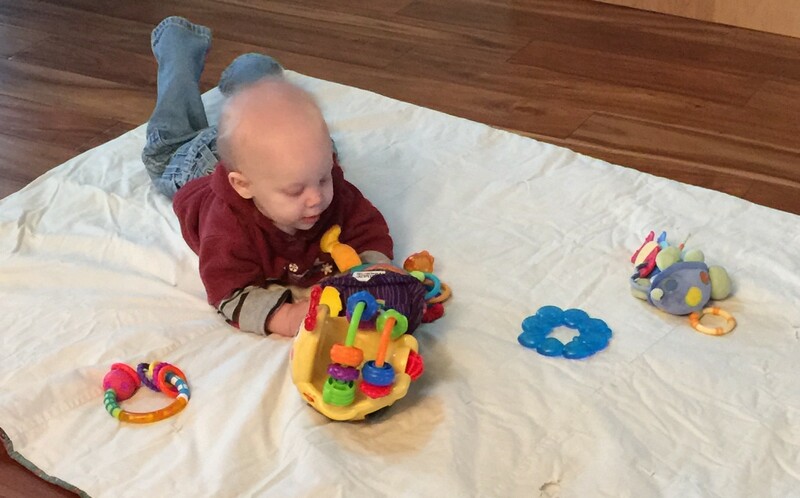 So how do you inspire your babies to WANT tummy time? Well, that’s different for every child. For Becca, she much preferred to sleep on her tummy, so tummy time usually turned into nap time if I’d let her. She needed LOTS of stimulation from me while on her tummy. I would get on my tummy too and we’d talk to each other. She LOVED that. 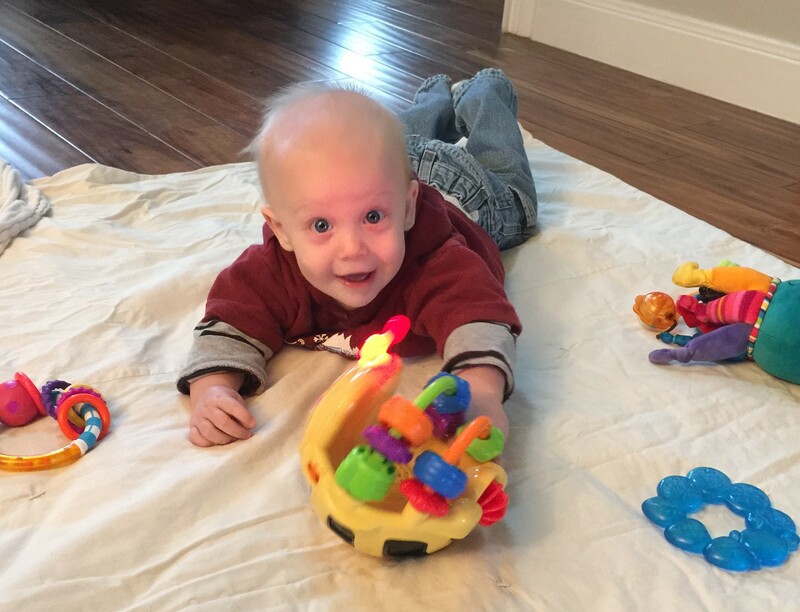 For Grayson, he’s pretty content as long as he has several toys around him. He loves that buzzy bee in the picture above – it makes fun noises and the antennae light up – encouraging him to keep his head up and watching it. I usually place several different things on his quilt (we have hardwood floors, so I always put down a cushy quilt for him, or have him on a sheet in his carpeted room) – a variety of distances away from him. So that he has to work to get to them. He really enjoys being on his tummy, so he doesn’t roll over to his back too often, although he does love playing with his toes, too, so sometimes he’ll roll over for a while, and then roll back. 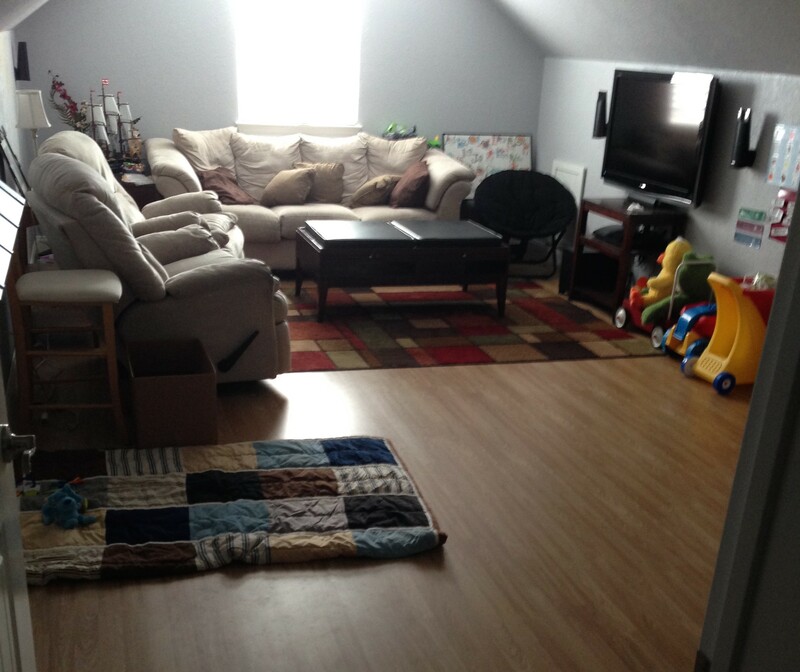 I wanted to create a special place for him in our family room – because we have our “adult” area with the couch and recliners, and then Becca’s playthings are everywhere, so I got a comforter out of the closet that has several really need textures on it, folded it in half, and created a little space just for him. 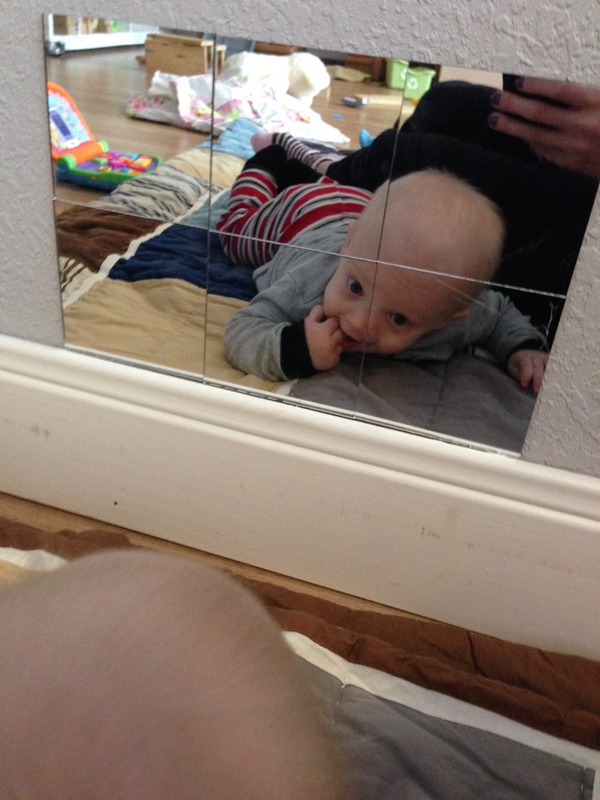 He has some toys, but the highlight of his play area is the little set of mirrors I attached to the wall. He loves looking at himself in the mirror! 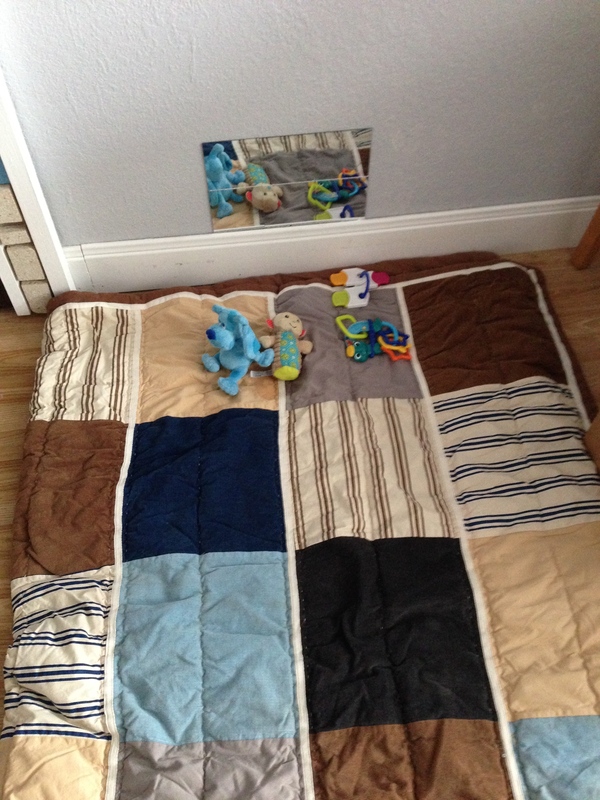 I got these 4″ Square Glass Mirror s (I purchased 6 – aff link) and just hot glued them on. There are lots of options for sizes and shapes: Darice Mirror Options . I certainly understand that sometimes tummy time isn’t the easiest task on a Mommy’s “to do” list for the day. And with an older child and two dogs running around, I certainly understand that leaving your baby on the floor can be a challenge. But it’s worth putting the dogs up, vacuuming, and getting the older one an “at the table” activity if need be. NOTHING can take the place of tummy time. Absolutely nothing. And nothing can make a mom feel proud like knowing that you’ve done something that has helped your child grow in a positive way. The morning I took this picture, I was in shock that when the bee rolled away, so did he. 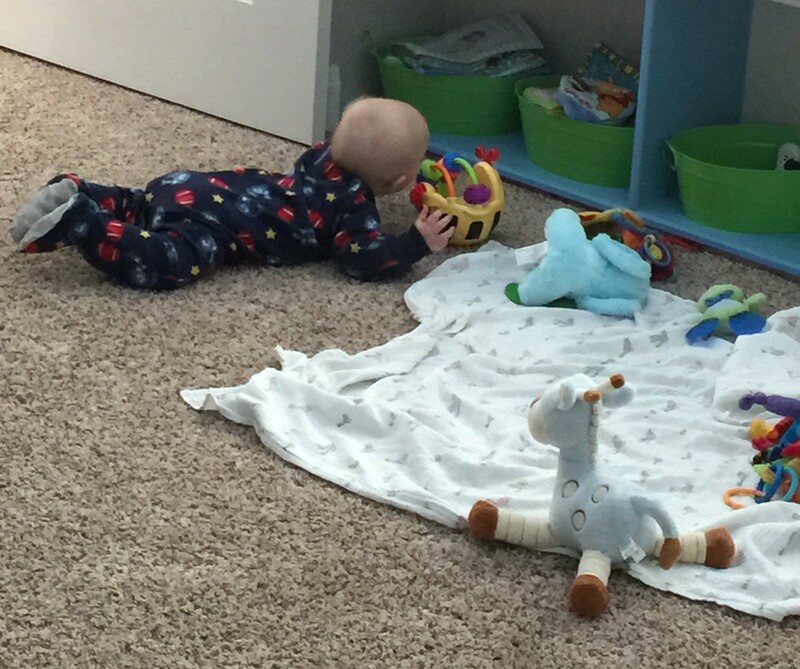 And so proud that my baby boy could finally roll over and over to get to the toy he wanted. Now, just a few short weeks later, he’s everywhere! Being a mom is a LOT harder than rocket science. There’s so many things that we have to do for our kids that stretch us and grow us. And it’s not always easy. But the rewards are so awesome. They make all the little bumps in the road worth while. Did you like this article? Please share! And be sure to “like” my Facebook page (link to your right) for more ideas, posts, and shared articles from others. Please note that Facebook is changing their page policies – if you want to see my posts, you’ll need to click “like,” “comment,” or “share” regularly for them to show on your newsfeed. If you don’t participate, you won’t see my stuff. Great post and thank you for sharing our post. We’re so glad you found it helpful!